When someone says, “It’s an up and coming area,” what does it mean? There might be potential for property here to rise in value but, what “Up and coming” really means is that the area’s shops, schools, transport, amenities and facilities are improving so residents’ lifestyles and local opportunities will be better. So, while your property may increase in value over time, it should also be a great place to live with everything you need close at hand. Richard Werth, CEO of Troy Homes gives a few insights on how his company looks at development opportunities to decide if the area is on the ascendancy or in a slow decline. If the local High Street has a good smattering of independent coffee shops, delis, pavement cafes or a microbrewery, then the chances are that this area has already come up and is doing well as this type of High Street can add up to 11% on property prices. However, all is not lost as, even in the most fashionable and desirable of areas, there are always a few hidden corners with potential. Some buyers will look for the “Waitrose effect” (a Waitrose store close by) as it can either add up to £36,500 and an M&S adds around £30,000 to the value of property. However, in the last three years property nearest to budget supermarkets such as Lidl and Aldi, Morrison’s and Asda has grown by as much as 11%. Equally, a down-at-heel High Street with empty shops might mean that the area is about to get a big investment boost that will radically change the landscape and community, so you could be ahead of the trend. Take Chesham as an example. 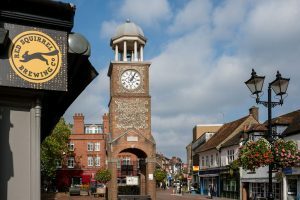 It is a lovely market town with an established commuter population, a regular underground service into London; in the heart of the Chilterns, outstanding local schools, a lively, pedestrianised town centre – all the things that are associated with a well-established, expensive, residential area. Therefore, you might think the only way you could afford to buy here is to buy a ‘wreck’ and do it up. Not so. Chesham prices are much lower than the surrounding area. We have recently launched Randall Way to the south east of town in the Waterside area where prices are lower because it is a slightly further to the Underground station. So, buyers can enjoy all the advantages of a beautiful market town in a spacious new home, with no stressful and time-consuming renovations and the walk or cycle to station is also a positive way to keep fit. These are sure sign that a neighbourhood could quickly become very desirable (or not). When we first saw the land in Farnham Royal, which is now Crown Gardens, we knew it had enormous potential because Cross Rail was coming to Slough (just 3 miles away). And, indeed we sold the first two properties to families who wanted lots of space, large garden and quick reliable journeys to the City/Canary Wharf. So, my tip is to lookout for imminent infrastructure improvements as they should have a positive impact on the area. However, a note of caution: Large infrastructure projects are often years in the planning so, when they are contentious, the local area stops in time until it is resolved. This hiatus will not just seriously impact house prices, investment in the community’s amenities and facilities such as schools, surgeries, shops and local road improvements can be also be delayed until there is more certainty. You could take a punt, but go into it with your eyes open. It is still your home. We look at house prices in neighbouring towns, villages and communities and see how they compare with the site we are buying. If they are high and stable, then there may be no room for further growth, but local people who want to stay in the area will move a little further away. In an area where properties are selling quickly and prices are lower, it could be going places and we may be able to build homes with more space and larger gardens because space is not yet at a premium. Look at the local shops, schools, sports clubs and facilities – if these are improving and well supported, then this is a very good sign for the future. You can look at local data online, but my advice is to take a walk around on a weekday, go into a pub or cafe and ask the staff what it is like to live here. They are usually happy to share their thoughts on a quiet weekday lunch service and their insights can be very helpful. If you are buying a property as an investment – somewhere that your money could safely grow ahead of inflation – then that is a different type of purchase to a lifetime home where you will share and create the momentous moments and memories that you will take into later life. Think carefully about what you want from the property over the next 10 – 15 years. Does the area provide for this? These are available online and give a very good idea of trends in specific postcodes. However, there is nothing to beat local knowledge. Behind the figures there may be a number of initiatives and factors that only local people will know about, so ask around. In summary, Richard’s advice is simple: Don’t be afraid to ask questions. Any developer or estate agent worth their salt should be able to help you understand the area better. Be thorough in your research – take the time to look at several areas as they might surprise you. And finally, sometimes temporarily deferring a cappuccino on the way to work might be worth it, because it won’t be for long. Coffee shops tend to set up very quickly in areas that are on the up! Following the preview event held at Robsons Estate Agents on Thursday 28th June (4pm – 7pm), prices and plans will be released for our new development Randall Way. Situated in the popular Waterside area of Chesham, this exclusive development will consist of ten homes with a mixture of a of 2, 3 and 4 bedroom properties. For more information, register your interest.